Feskekörka is the impressive fish market in Göteborg, Sweden. 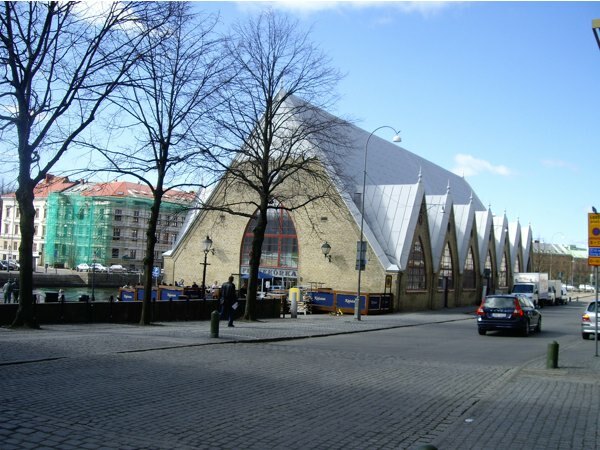 It means the Fish Church, referring to its unusual architectural features. A visit here is a joy for lovers of fish and other seafood. We went there on our way from our hotel to Haga, walking along the harbour. Then we saw Feskekörka with its steep roof and gables and as we entered, we discovered a temple dedicated to all delicacies from the ocean. It was designed by Victor von Gegerfelt and was inaugurated year 1874. 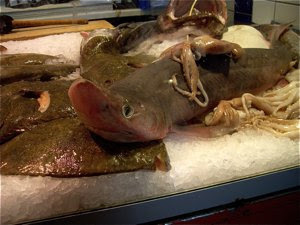 As a major port on the western coast of Sweden, good seafood is available in abundance. Norwegian lobsters, pelagic fish and deep sea monsters as this angler fish, a member of the order Lophiiformes. They are named for their characteristic mode of predation, wherein a fleshy growth from the fish's head acts as a lure analogous to angling. 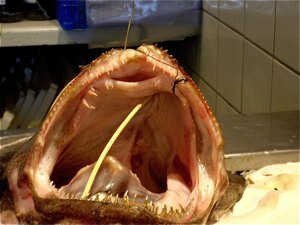 The most common in our waters is the monkfish. It looks scary, but its meat is among the best you can prepare for dinner. And if you do not want the inconvenience of preparing your own food, there is a good selection of prepared fish meals. You can bite into a baguette with fresh prawns and mayonnaise, or buy a container with delicious fish or lobster bisque. I just wished I had a food hall like this to visit after a hard day's work. If you are even more tired or just plain lazy, there are even a few restaurants at Feskekörka where you may sit down and enjoy the atmosphere. As Restaurang Gabriel run by the chefs Johan and Gunnar Malm. Here you may choose from the most delicious lunch menu. 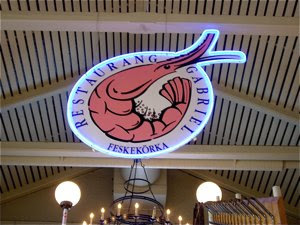 Here you may choose from grilled Norway lobsters or prawns from Smögen. 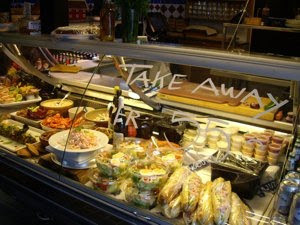 You may pick a few French or Swedish oysters, or choose a cold or hot open sandwich with prawns or fish roe. Fish or lobster bisque or other hot dishes made from sole, salmon, or plaice are also on the menu.